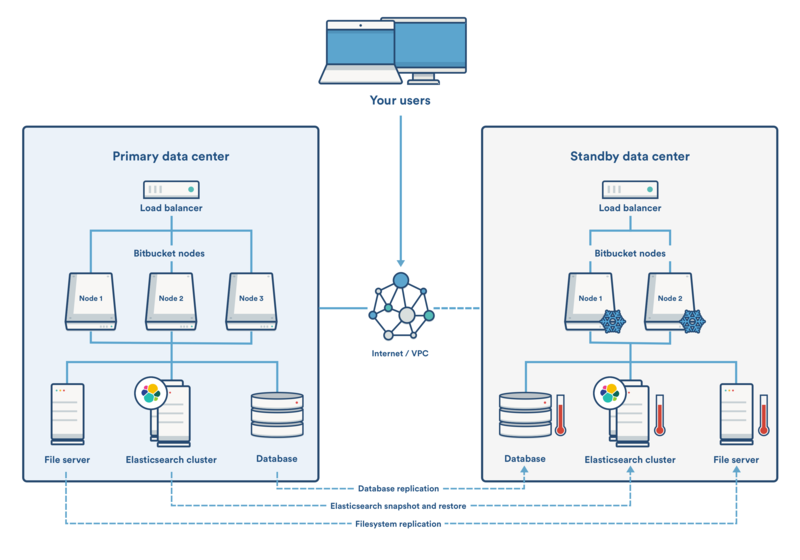 This page demonstrates how Bitbucket Data Center can be configured to implement and manage a disaster recovery strategy. It doesn't, however, cover the broader business practices, like setting the key objectives (RTO, RPO & RCO 1), and standard operating procedures. A disaster recovery strategy is a key part of a business continuity plan. It defines the processes to follow in the event of a disaster to ensure your business can recover and keep operating from a standby system. This means your Bitbucket instance, and more importantly your Bitbucket managed data (source code), is available in the event that your primary system becomes unavailable. Bitbucket Data Center 4.8 or later is required to implement the strategy described in this guide. Before you begin, read these initial subsections to get familiar with the various components and terminology used in this guide, review the requirements that must be met to follow this guide, and introduce the example scripts used to perform actions described in this guide. Cold standby - This guide describes what is generally referred to as a "cold standby" strategy. That means that the standby Bitbucket instance is not continuously running and that some administrative steps need to be taken to start the standby instance in the event of a disaster scenario. Recovery Point Objective (RPO) - How up-to-date you require your Bitbucket instance to be after a failure. Recovery Time Objective (RTO) - How quickly you require your standby system to be available after a failure. Recovery Cost Objective (RCO) - How much you are willing to spend on your disaster recovery solution. High availability – A strategy to provide a specific level of availability. In Bitbucket's case, access to the application and an acceptable response time. Automated correction and failover (within the same location) are usually part of high-availability planning. Disaster recovery – A strategy to resume operations in an alternate data center (usually in another geographic location), in the event of a disaster whereby the main data center becomes unavailable. Failover (to another location) is a fundamental part of disaster recovery. A typical deployment of Bitbucket with a standby for Disaster Recovery is depicted in the following diagram. The standby Bitbucket instances are "cold" (i.e., not running) and the shared file server, database and (optionally) Elasticsearch instances are "warm" (i.e., running) so that replication can occur. Example component diagram of a typical DR deployment. your database to be capable of replication to a remote standby. The shared home directory contains your repository data, log files, user-installed plugins, and so on (see Bitbucket Server home directory for more detail). You need to replicate your shared home directory onto your standby file server. This process needs to be quick, reliable, and incremental to ensure the standby is as up to date as possible. You must choose a file system replication technology that will maintain the data integrity of the Git repositories on disk. For example, a replication technology such as RSync would not meet this requirement, as a repository might change during the transfer, causing corruption. The best way to achieve the desired level of consistency is to use a file system which supports atomic block level snapshots. All files in the snapshot are effectively frozen at the same point in time regardless of how long the replication to the standby takes. The example scripts implement ZFS as the file system for the Bitbucket shared home, as it allows light weight snapshots which can be transferred and restored on a remote system. The database contains data about pull requests, comments, users, groups, permissions, and so on. You need to replicate your database and continuously keep it up to date to satisfy your RPO. See the Supported platforms - Databases section for more details about choosing a supported database technology. These Bitbucket Data Center supported database suppliers provide their own database replication solutions. This is not technically a key data store as its data derives from a combination of database and repository content. Bitbucket search detects an out of date index and incrementally reconstructs it. However, rebuilding the search index, especially for large installations, can be time consuming, during which search functionality will be impacted. The example scripts implement Elasticsearch snapshots using either s3 or the shared filesystem as the snapshot repository. These scripts will configure the snapshot repository and take manual snapshots. These data sources comprise the entire state of your Bitbucket instance. Files added through other means, such as files added by plugins, will require another means of replication. In these cases, contact the plugin vendor for recommendations. These scripts are meant to serve as a starting point, rather than a fully worked DR solution, and should only be used after first configuring and customizing them for your specific environment. To get the scripts, clone or pull the latest version of atlassian-bitbucket-diy-backup. You must configure additional variables for these home and database types, and install the same scripts on both the primary and standby systems to use them for Disaster Recovery. Refer to bitbucket.diy-backup.vars.sh.example in the atlassian-bitbucket-diy-backup repository for more information on configuring the scripts for Disaster Recovery. When you create an EBS snapshot, the scripts now tag it with the name of the EBS volume. This 'Device' tag allows the snapshot to be automatically cleaned up, and without it you cannot restore your snapshot. If you took your snapshot with scripts created before 18 September 2018, it won't have a 'Device' tag and you won't be able to restore it. To fix this, use the AWS console to add a tag to the EBS snapshot with with "Device" as the key and "<device_name>" as the value. <device_name> should be the device name of the EBS volume holding the shared home directory (e.g. "Device" : "/dev/xvdf"). Install Bitbucket Data Center on the standby instance the same way you would set up a primary instance. The standby instance is effectively an exact replica of the primary instance, and therefore requires all the components deployed in the primary to be deployed in the standby. This includes a single node or clustered data center instance, database, Elasticsearch and a file server to serve the shared home folder. See Installing Bitbucket Data Center for specific, detailed installation procedures. If you start the Bitbucket service before the failover process, the database and file server replication may fail, preventing the standby from serving as a replica. Starting your standby instance to test your setup is discussed later in the document in the section Disaster recovery testing. This section contains instructions for setting up replication to your standby instance, so that in the event of a disaster you can failover with minimal data loss. Set up file server replication - Set up your standby file server as a replica of your primary. Only the volume containing Bitbucket's shared home directory needs to be replicated. Refer to your file server vendor's documentation for more information. Set up database replication - Set up your standby database as a read replica of your primary database. Refer to your database vendor's documentation for more information. Set up Elasticsearch replication (optional) - The developers of Elasticsearch, provide detailed instructions on setting up snapshot repositories and how the snapshots contained in these repositories can be transferred to the standby cluster. See their article titled Snapshot And Restore for more information. The example scripts will configure the snapshot repository and take manual snapshots using either an s3 or shared filesystem repository. Once you setup replication, ensure the primary instance is replicating to the standby instance. The method of replication varies depending on the chosen technology. Once set up correctly, most database replication technologies are automatic and do not require ongoing manual steps. File system replication technologies may require the ongoing transfer of snapshots from the primary system to the standby to be automated (for example, via cron). If using the atlassian-bitbucket-diy-backup worked example scripts, then you can manually test file system replication by running this command on the primary file server. Once file system replication is working, you may add a crontab entry for this command on a regular interval (e.g., every minute) as determined by your organization's RPO. Practice makes perfect, and this applies to verifying your DR failover process, but there is a serious caveat. As Bitbucket's configuration lives in the shared home folder which is replicated from the primary, the settings in the bitbucket.properties file points at production instances, which must be changed before starting the standby instance for testing. You should exercise extreme care when testing any disaster recovery plan. Simple mistakes could cause your live instance to be corrupted, for example, if testing updates are inserted into a production database. You may detrimentally impact your ability to recover from a real disaster while testing your disaster recovery plan. It is important to note that your standby instance will be configured as if it was the primary, which can cause issues when testing your disaster recovery plan. When running Bitbucket in disaster recovery mode, the integrity checker may attempt to correct errors it finds when the file server is out of sync with the database. This includes merging, re-opening, and declining pull requests which can cause Jira tickets to update via applinks, and could also send out email notifications. Before testing, isolate your standby instance! Keep the standby data center as isolated as possible from production systems during testing. You will need to prevent replication from the primary whilst testing your standby instance. Isolate your database - Temporarily pause all replication to the standby database, then promote the standby database. Isolate your file system - Temporarily pause replication to the standby file system, then promote the standby file system. Update any other settings that point at production instances to use their standby counterpart. Once you have isolated your standby instance, you can now test your disaster recovery plan. Ensure that the standby database has been promoted and is writable. Ensure that the new shared home directory is ready. Ensure your bitbucket.properties file is correctly configured. Monitor the Bitbucket log file and check for consistency issues, as described in Running integrity checks in Bitbucket Data Center. Resetting your DR deployment involves restoring the standby components into a state whereby replication can occur, and this state differs based on the chosen file server and database replication technology. In many cases it may be easier to setup your standby infrastructure again. Once validation of the standby instance is complete, stop Bitbucket. Restore the file server to a state in which replication can begin. Restore the database to a state in which replication can begin. In the event your primary instance is unavailable, you need to failover to your standby system. This section describes how to do this, including instructions on how to check the data in your standby system. Promote your standby database - Ensure the standby database is ready to accept connections and can no longer receive any further updates from the primary. Refer to your database vendor's documentation for more information. Promote your standby file server - Ensure the standby file server can not receive any further updates from the primary. Refer to your file server vendor's documentation for more information. Note that during normal replication, bitbucket.properties on the standby is identical to the primary system. During failover, it is important to ensure the configuration of your bitbucket.properties file matches the standby system's configuration before you start Bitbucket on the standby, or the standby may not start or attempt to connect to services in the primary's environment. Start Bitbucket on one node in the standby instance. If required, start the other Bitbucket nodes. Update your DNS, HTTP Proxy, or other front end devices to route traffic to your standby server. Update the mail server configuration if the mail server differs from the production mail server. Schedule a reasonably-sized outage window. Take a full backup of the standby system's home directory and database (for example, with the tools described in Data recovery and backups), and restore it on the primary system. Run the replication and failover steps in reverse, where the standby system now takes the role of the primary, and the original primary system acts as a standby until you cut over. If you use host names to address the partners in the link and the backup Bitbucket server has the same hostname, via updates to the DNS or similar, then the links should remain intact and working.